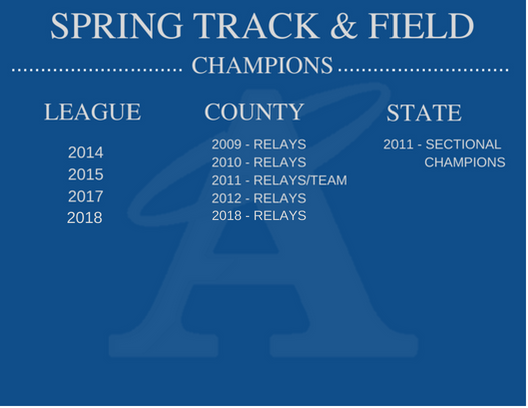 Led by a one of the finest and most revered coaches in Bergen County, Howard Schuman, our Spring Track team is a perennial favorite at the League, County and State level. With over 100 girls coming out for the team each spring, our large coaching staff prides itself in helping every athlete, no matter what the skill set, achieve personal goals while continuously striving to improve. Our team works very hard and the results show with numerous County and State Championships. Individually many of our athletes have been extremely successful garnering All County, All State and even National distinction. It is a credit to our coaching staff that many of our athletes enjoy highly successful careers at the collegiate level. The 2018 Spring Track season was a very successful one, both team-wise and individually. Our team was the first one ever to win all three major relay meets…the Season Opener, Comet Relays and the Bergen County Relays. We then went on to win the League Championship, finish 2nd in the County Individual Meet and place second in the State Sectional Meet. Our 4x800 relay team( Tara Lyons, Christina Bagin, Olivia Mandella and Abby Sheehan) became the first relay team at Holy Angels to ever qualify for the Championship of America race at the prestigious Penn Relays, where the team finished fifth in their race. Individually, Anya Skae won the shot put and discus championship at the League, County and State Sectionals. Caroline McGann won the same three championships in the Pole Vault. Samantha Romano also won the League and County championship in the javelin. Mackenzie Hughes won the League Championship in the 1600 and the 3200. She was also the County and State Champ in the 3200. The 4x400 relay team (Maris Rodriguez, Christina Bagin, Dylan Vonderhorst and Abby Sheehan won the League Championship. The 4x100 relay team (Veronique Dhont, Nicole Barbaro, Charlotte O’Donoghue and Maris Rodriguez broke the school record in the State Group Meet.